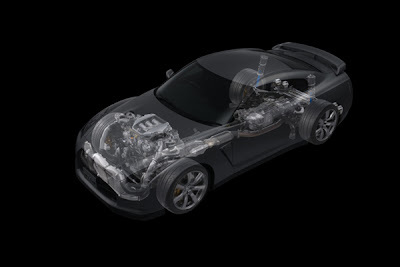 "Chief vehicle engineer Kazutoshi Mizuno told CAR Online that the GT-R models bound for the American market would benefit from a range of small tweaks, including three harder engine mounts and a stiffer transaxle mount to stop the mechancial parts from moving under extreme cornering. It's detail like this that enabled the new 7min 29sec..."
"The same changes will be rolled out to every GT-R; this is a global model and one week after the US-spec modifications were made, they were applied to the domestic market cars." "Mizuno told CAR Online that Euro-spec GT-R models would probably gain further modifications. The team will decide in September 2008 exactly what to change, but he said it was likely that the rubber bushes in the steering system would be revised and the rear differential could be recalibrated." Continual updates and changes to make it better. Sounds good to me. ZRwhat?